What equipment do I need to receive phone captions? Where can I get a CapTel Phone? Can I receive captions in Spanish? If I don’t use the caption feature, does it affect the amplification gain? What happens to the CapTel Phone when it is unplugged or power is lost? I’m experiencing difficulty connecting to Hamilton CapTel service. How do I know if there’s an service interruption occurring? Captioned Telephone (or CapTel) is a telephone technology that allows people to receive word-for-word captions of their telephone conversations. It is similar in concept to Captioned Television, where spoken words appear as written text for viewers to read. The CapTel phone looks and works like any traditional phone, with callers talking and listening to each other, but with one very significant difference: Captions are provided live for every phone call. The captions are displayed on the phone’s built-in screen so the user can read the words while listening to the voice of the other party. So if the CapTel phone user has difficulty hearing what the caller says, he or she can easily read the captions for clarification. The CapTel user dials the number of the person they wish to call on the CapTel phone. By clicking on the Captions Button to activate captions, the call is transparently connected to a captioning service that provides the captioning. At the CapTel service center, a specially trained operator uses the latest in voice-recognition technology to transcribe whatever is being said by the other party. The voice recognition system generates the operator’s voice into captions, which are bundled with the speaking party’s actual voice and sent directly to the CapTel phone. When the CapTel phone receives this combined information, the voice and captions are split so that the voice goes to the earpiece of the phone and the captions go to the display screen. 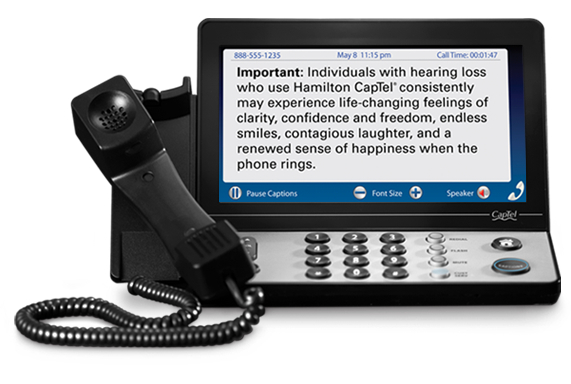 The CapTel Captioned Telephone is designed for people who have difficulty hearing over the phone. People who do not require captioning support for their telephone calls should only use the CapTel phone with the CAPTIONS featured turned off. The CapTel phone is intended to facilitate telephone communication between two or more parties on a telephone call. Any other use of the phone is considered a violation or misuse of the service. Captions cannot be displayed on a regular telephone but with the addition of a PC/Mac, Smartphone or Tablet you may receive captions for your calls. However, the CapTel phone includes a customized, built-in screen for displaying captions as well as a combination of sophisticated electronics and software to handle both the voice and captions simultaneously. A CapTel Phone connected to a telephone line (i.e. analog or digital telephone line), internet connection and a power adapter are required to receive captions. Smartphone: A Hamilton CapTel Account, compatible smartphone, voice and data capability, and the Hamilton CapTel App. Tablet: A Hamilton CapTel Account, compatible tablet with Internet connection, a phone (i.e. home, office, cell phone or smartphone), and the Hamilton CapTel App. Order your CapTel Phone online or simply call 888-514-7933. Yes, Spanish captions are available 7am to 11pm CT, 7 days a week. Spanish CapTel users must enable the Spanish captions option from the menu by clicking the “Phone Settings” option then select “Spanish Captions”. Select “Enabled” and click the “Yes” button to enable this feature. Yes. When captions are off, the maximum amplification gain is 18dB. When caption are on, the maximum amplification gain is 40dB. The CapTel Phone will not function if it does not have electrical power. In addition, any saved conversations and call history will be deleted. However, all CapTel Phone Settings are saved even when power is lost. How do I place a call with the CapTel Phone? Can I save the telephone numbers that I dial often? Just like any telephone, pick up the phone, press the captions button to turn on the captions and dial the number of the person you are calling. When captions are activated on your phone, you will automatically receive captions on your screen. Captions, by default, are set to “off” and will not appear automatically for every call. You will need to press the captions button at the start of every call in order to turn them “on”. When captions are “on”, you will see a red light displayed around the captions button. Yes, the CapTel Phone has a “Phone Book” feature where you can store frequently called telephone numbers. Go to the menu, select “Edit Phone Book” option, select “Add a New Contact” option, press the “yes” button and add the person’s name and telephone number. How do I receive a call with the CapTel Phone? How do people call me using the CapTel Phone? How do I activate captions for incoming calls with the CapTel Phone? As with any telephone, when someone dials your number directly the CapTel Phone will ring and you simply pick up the receiver to answer. Press the captions button to activate the captions on your phone, you will receive captions on your screen instantly. The person calling you simply dials your telephone number directly. Simply press the captions button to turn captions on or off. When the captions button is illuminated red, captions are activated. Can I turn the captions on / off anytime during the call? Does Caller ID work with the CapTel Phone? I subscribe to Caller ID. How do I check my Call History? Can I change the font size, font color and background color? Can I review the captions (scroll up or down) while still on the call? Can I save telephone numbers to a directory on my CapTel Phone? Does the CapTel Phone have a speakerphone option? Is the CapTel Phone hearing aid compatible? Can I access the menu options during a call? Can I adjust the Ringer Volume on the CapTel Phone? Can I adjust the Ringer Pitch on the CapTel Phone? Can I set the Captions Default to on or off? How do I delete saved captions from the CapTel Phone? Can deleted captions be recovered? Can the CapTel Phone save the captions of all my conversations? How do I update my phone with the latest software? Yes. Simply press the captions button to turn captions on or off at anytime during your call. When the captions button is illuminated red, captions are activated. Yes, as long as you subscribe to the Caller ID feature through your telephone service provider. You may check your Call History by going to the main menu. Select “Call History” option and press the “Yes” button. A list of calls will be displayed. Yes. All of these settings can be managed in the Options Menu under the Display Settings selection. Yes. Your CapTel phone comes with the Save Conversations feature enabled, letting you view conversation captions after you’ve hung up the phone. From the Options Menu select “Review Conversations” to see your saved conversation. Please note that the CapTel Phone saves up to 480 lines of captions. As new captions are received, earlier/older captions are erased. Yes, the CapTel Phone has a “Phone Book” feature that allows you to easily store up to 97 names/telephone numbers. This feature is available on the CapTel 2400i model. If you have a 2400i and the feature is not available to you, please make sure you have the latest software update on your phone. The CapTel 840i and 880i do not have built-in speakerphone capability, however an external speaker can be connected to these models in order to provide speakerphone capability. Users of the CapTel 840i or 880i can connect an external speaker into the appropriate 2.5 mm or 3.5 mm audio jack and enjoy speakerphone capability. Should you have additional questions about such, please call: 866-990-4499. At this time, it is not possible to access the menu options during the call. It is recommended that you set your call preferences prior making and receiving calls. Yes, you may adjust the ringer volume by selecting the “Phone Settings” menu option. Your CapTel Phone comes with the Captions Default set to OFF. Simply press the captions button to turn captions on or off at anytime during your call. When the light around the captions button is red, captions are activated. You can delete saved captions in the Conversation Options Menu. No. Once the “Delete All Captions” is selected and the “Yes” button pressed, the deleted captions cannot be recovered. Your CapTel phone comes with the Save Conversations feature enabled. From the Options Menu select “Review Conversations” to see your saved conversation. Please note that the CapTel Phone saves up to 480 lines of captions. As new captions are received, earlier/older captions are erased. To determine whether you have a software update available, you will need to access the Options on your phone. With the handset placed on the phone, press the “Yes” button. Use the down arrow to move the highlight, and select “Settings”. Select “Phone Settings”, then select “Update Phone”. Follow the instructions on the screen. To determine whether you have a software update available, you will need to access the Settings option on your phone. Select the “Settings” icon, then select “About” and “Update”. If there is an update available, your phone will begin to load the update, which will also reboot your phone. Once the update has been made, you can use the phone as you normally would. Are long distance charges incurred when using the CapTel Phone? Can I make international calls using the CapTel Phone? Do I have to register my long distance provider when using the CapTel Phone? If my Internet service goes down, will the CapTel Phone operate as a standard phone? Whether or not you are charged for long distance calls depends on the telephone service plan and your telephone service provider. There are no additional charges to receive captions. International calls can be placed and received, with captions. Whether or not you can place International calls depends on the telephone service plan and your telephone service provider. There are no additional charges to receive captions. You are responsible for any long distance charges incurred, but the charges will appear on your regular phone bill. This depends on the type of phone service you are using with the CapTel Phone. If you are using an analog phone service, when/if your connection to the Internet is lost, your CapTel Phone will work as a standard telephone with no captions. If, however, you are using an Internet-based phone service with your CapTel Phone, your phone will not be operational until your connection to the Internet is restored. What are the technical requirements for the CapTel Phone? What is the best location in which set-up my CapTel Phone? Do I still need my telephone service? How can I get technical assistance with the set-up and use of my CapTel Phone? High-speed Internet access (broadband or digital cable service, not dialup). Depending on your set-up, a router may also be required to connect more than one device to your Internet service. Telephone service (can be standard analog-POTS, VOIP, cable telephone service, FIOS). Please Note: The CapTel Phone is not compatible with digital PBX systems found in offices or some residential facilities (unless an analog port is available). There is a high-speed Internet (Ethernet) jack or your home router is located nearby. There is a telephone jack nearby (can be analog line, VOIP, FIOS, or Digital Cable phone service). There is an electrical outlet nearby. The surface it will be set on, or mounted to, is stable and secure. The area is protected from excessive heat or humidity. NOTE: The outlets for power, the phone line, and the Ethernet connection should all be located nearby, as each cord needs to plug into your CapTel Phone. If your Internet access is located in a different room than where you plan to use the CapTel Phone, see the Installation Guide or contact CapTel Customer Service at 888-514-7933 for help. Yes. The CapTel Phone requires both a telephone service and Internet connection. For set-up and initial installation, please download the CapTel Phone Installation Guide. For detailed instructions regarding the use of your CapTel Phone, please download the CapTel Phone How-To Guide. For additional assistance, please call CapTel Customer Service: 888-269-7477. If I call 911 using the CapTel Phone, will I still receive captions? Will 911 emergency call centers be able to identify my location if I dial 911 with my CapTel phone (Models 800i, 840i, 880i and 2400i)? Yes. Please be sure that Captions are activated and your Internet connection is active. Yes. The 911 centers have the ability to identify your location based on your specific incoming phone number. Why do I need to register my phone? What happens if I don’t register my phone? What does Hamilton CapTel do with my registered information? Per a recent ruling by the Federal Communications Commission (FCC), new customers of IP captioned telephone services must register as part of the FCC’s efforts to protect the captioning service from potential misuse by individuals who do not need captioning support. Per FCC requirements, the Captions feature on your CapTel phone will not be activated until the phone is registered. You will still be able to use the phone to make and receive calls, however, no captions will be available. The FCC works to protect captioned telephone service from potential misuse by people who may not need captioning assistance. Your registration information confirms that you are at least 18 years of age, and are a US citizen. All information provided is treated, by law, as confidential. Don’t own a CapTel Phone yet? If hearing on the phone is the problem, Hamilton® CapTel® is the perfect solution. You’ve read captions on TV – now imagine reading captions on your telephone. This is what the Hamilton CapTel Phone is all about. Order Your Hamilton CapTel Phone Today! The Hamilton CapTel 2400i requires telephone service and high-speed Internet access. Wi-Fi capable.